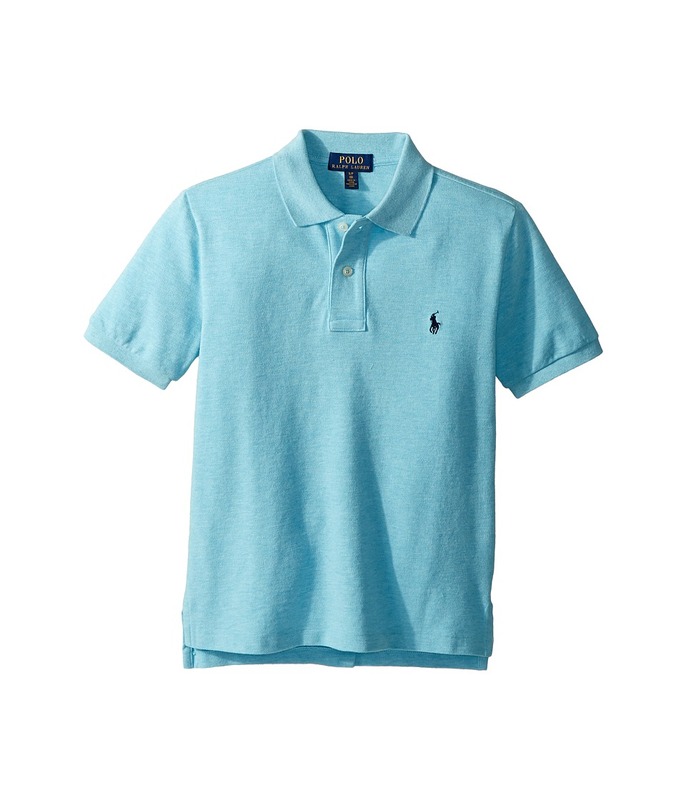 Take the Polo Ralph Lauren Kids Moisture-Wicking Polo Shirt from the classroom to the playground with ease. Sporty polo shirt is crafted from a moisture-wicking stretch lisle fabric to keep him cool and comfortable all day. Ribbed polo collar with a two-button placket. Short sleeves with ribbed armbands. Signature embroidered pony at the left chest. Printed neck tag for added comfort. Tennis-tail hemline. 92 percent polyester, 8 percent elastane. Machine wash cold, tumble dry low. Imported. Measurements: Length: 23 in Product measurements were taken using size SM (8 Big Kids). Please note that measurements may vary by size. Take the Polo Ralph Lauren Kids Moisture-Wicking Polo Shirt from the classroom to the playground with ease. 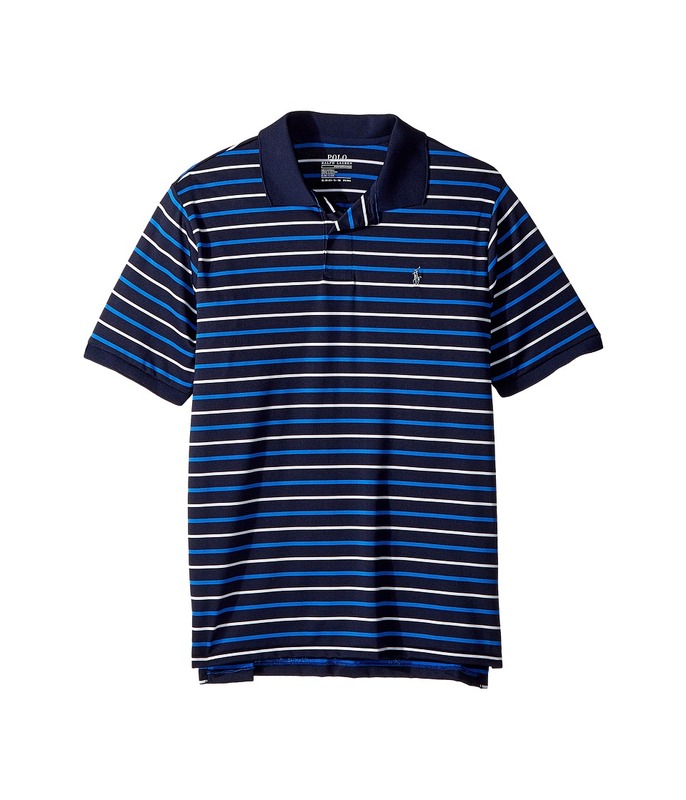 Sporty polo shirt is crafted from a moisture-wicking stretch lisle fabric to keep him cool and comfortable all day. Ribbed polo collar with a two-button placket. Short sleeves with ribbed armbands. Signature embroidered pony at the left chest. Printed neck tag for added comfort. Tennis-tail hemline. 92 percent polyester, 8 percent elastane. Machine wash cold, tumble dry low. Imported. Measurements: Length: 28 1 2 in Product measurements were taken using size XL (18-20 Big Kids). Please note that measurements may vary by size. Take the Polo Ralph Lauren Kids Camo Performance Lisle Polo shirt from the classroom to the playground with ease. 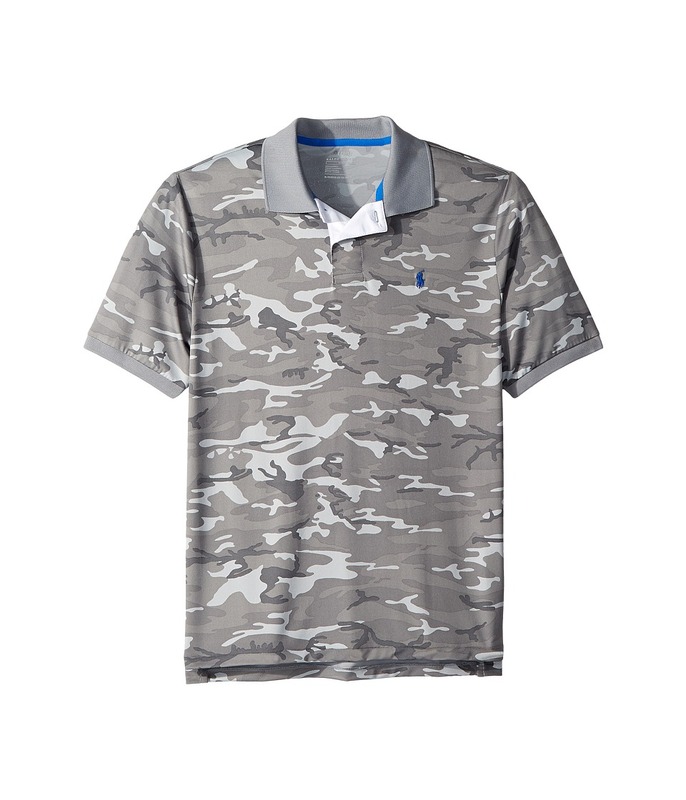 Camouflage-printed polo shirt is crafted from a moisture-wicking stretch lisle fabric to keep him cool and comfortable all day. Ribbed polo collar with a two-button placket. Short sleeves with ribbed armbands. Signature embroidered pony at the left chest. Printed neck tag for added comfort. Tennis-tail hemline. 92 percent polyester, 8 percent elastane. Machine wash cold, tumble dry low. Imported. Measurements: Length: 28 1 4 in Product measurements were taken using size XL (18-20 Big Kids). Please note that measurements may vary by size. The Polo Ralph Lauren Kids Cotton Mesh Polo Shirt is a classic essential to his stylish wardrobe. 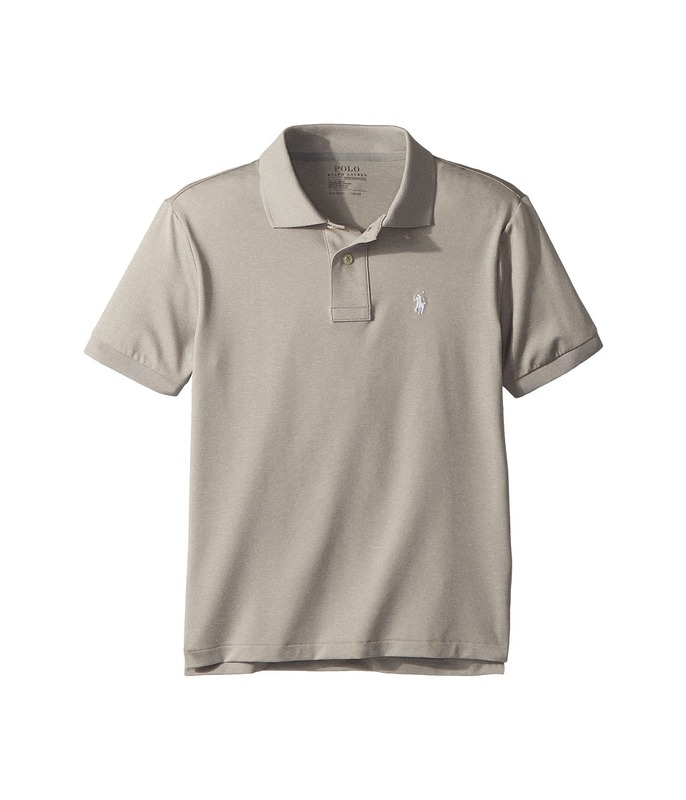 Lightweight, breathable cotton mesh polo shirt sports a signature embroidered pony at the chest. Ribbed polo collar with a two-button placket. Short sleeves with ribbed armbands. Tennis tail. 100 percent cotton. Machine wash cold, tumble dry low. Imported. Measurements: Length: 21 1 2 in Product measurements were taken using size SM (8 Big Kids). Please note that measurements may vary by size. 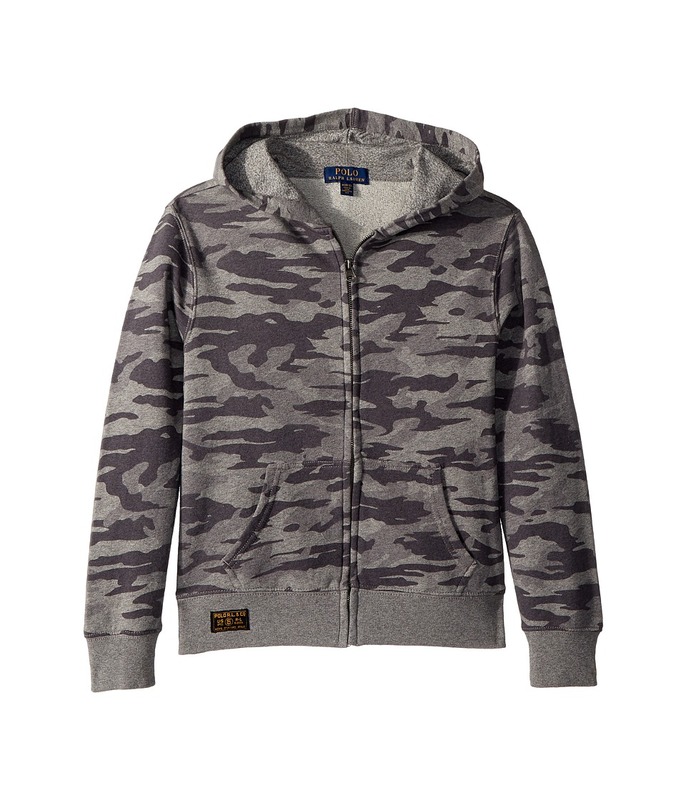 The Polo Ralph Lauren Kids Camo Print Cotton Hoodie is the perfect cool-kid jacket to finish off his layered look. Zip-up hoodie is crafted from a comfortable French terry fabrication and boasts an eye-catching camouflage print throughout. Attached hood with a soft jersey lining. Long sleeves with ribbed cuffs. Full-zip front with a signature zipper pull. Kangaroo hand pockets. 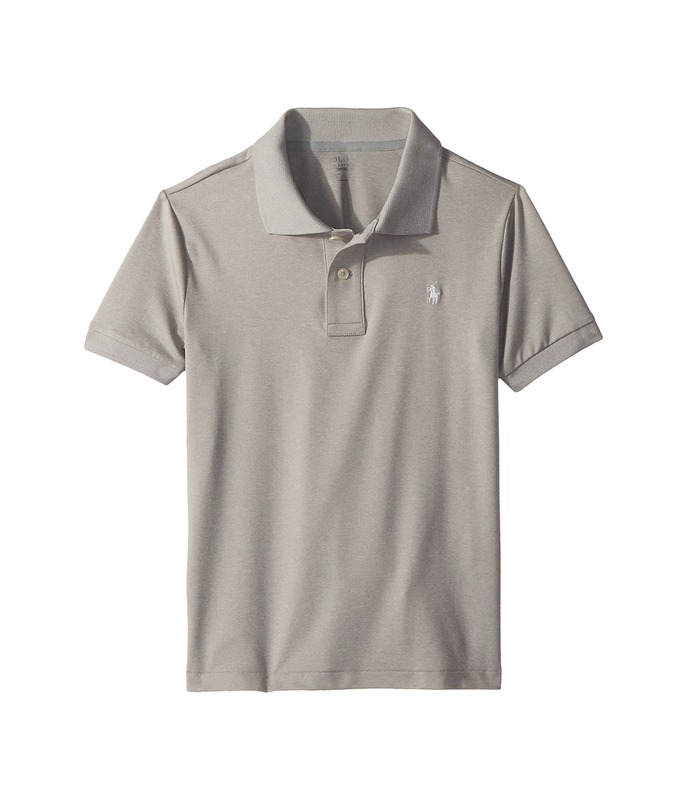 Woven Polo R.L. Co U-S R-L Men~s Standard Issue label at the front right hem. 100 percent cotton. Machine wash and tumble dry. Imported. Measurements: Length: 21 in Product measurements were taken using size MD (10-12 Big Kids). Please note that measurements may vary by size. 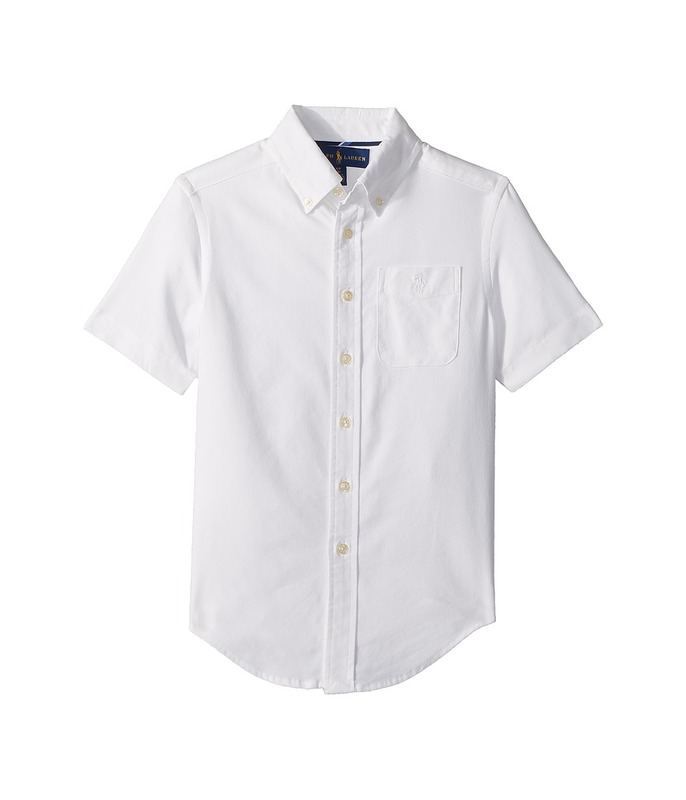 The Polo Ralph Lauren Kids Performance Oxford Shirt is a comfortable classic that he can dress up or down. Lightweight oxford shirt featuring a versatile colorway throughout the cotton-blend, moisture-wicking fabric. Signature embroidered pony at the left chest pocket. Button-down point collar. Short sleeve construction. Full button-up front closure. Box-pleated back yoke. Shirttail hemline. 55 percent cotton, 40 percent nylon, 5 percent elastane. Machine wash cold, tumble dry low. Imported. Measurements: Length: 21 1 2 in Product measurements were taken using size SM (8 Big Kids). Please note that measurements may vary by size. 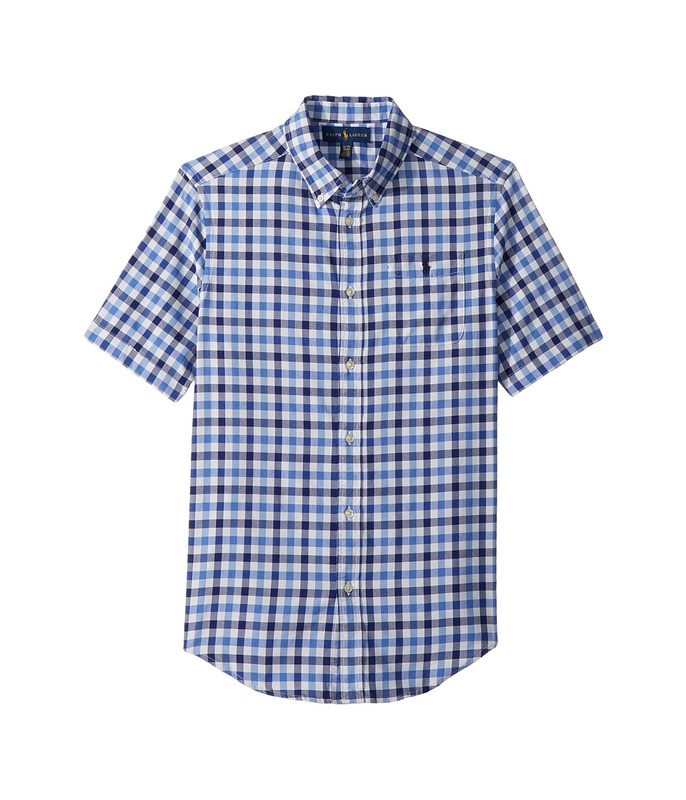 The Polo Ralph Lauren Kids Plaid Performance Oxford Shirt is a comfortable classic that he can dress up or down. Lightweight oxford shirt featuring gingham-plaid pattern throughout the cotton-blend, moisture-wicking fabric. Signature embroidered pony at the left chest pocket. Button-down point collar. Short sleeve construction. Full button-up front closure. Box-pleated back yoke. Shirttail hemline. 53 percent cotton, 43 percent nylon, 4 percent elastane. Machine wash cold, tumble dry low. Imported. Measurements: Length: 29 in Product measurements were taken using size XL (18-20 Big Kids). Please note that measurements may vary by size. Printed with POLO pride, the Polo Ralph Lauren Kids Camo Cotton Jersey T-Shirt is sure to be the star of his summertime style. 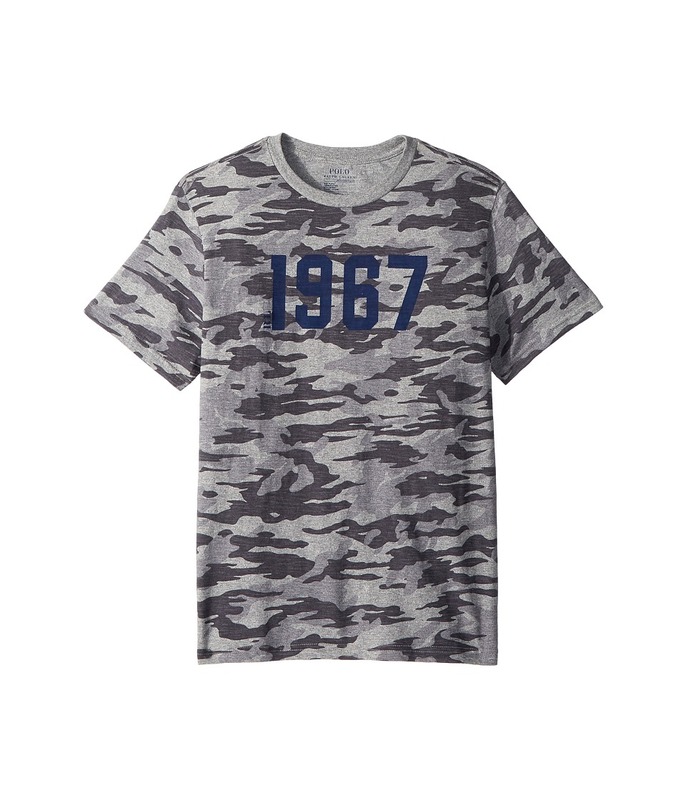 Super-soft slub-jersey T-shirt boasts an eye-catching camouflage print throughout and 1967 printed on the chest. Crew neckline with a printed neck tag for added comfort. Short sleeve construction. Easy pullover design. Straight hemline. 100 percent cotton. Machine wash cold, tumble dry low. Imported. Measurements: Length: 26 in Product measurements were taken using size LG (14-16 Big Kids). Please note that measurements may vary by size. The Polo Ralph Lauren Kids Relaxed Fit Cotton Shorts are durable enough for warm rough and tumble days but have a sleek look for handsome dress-up days as well. Relaxed-fit pull-on shorts crafted from a lightweight, durable twill fabrication. Stretch waistband with a faux-drawstring closure. Four-pocket construction. Faux-fly detailing. Rolled cuffs. 100 percent cotton. Machine wash cold, tumble dry low. Imported. Measurements: Waist Measurement: 30 in Outseam: 20 in Inseam: 8 1 2 in Front Rise: 11 1 2 in Back Rise: 12 in Leg Opening: 21 in Product measurements were taken using size XL (18-20 Big Kids). Please note that measurements may vary by size. Style and comfort work hand in hand with the must-have Polo Ralph Lauren Kids Camo Cotton French Terry Shorts. 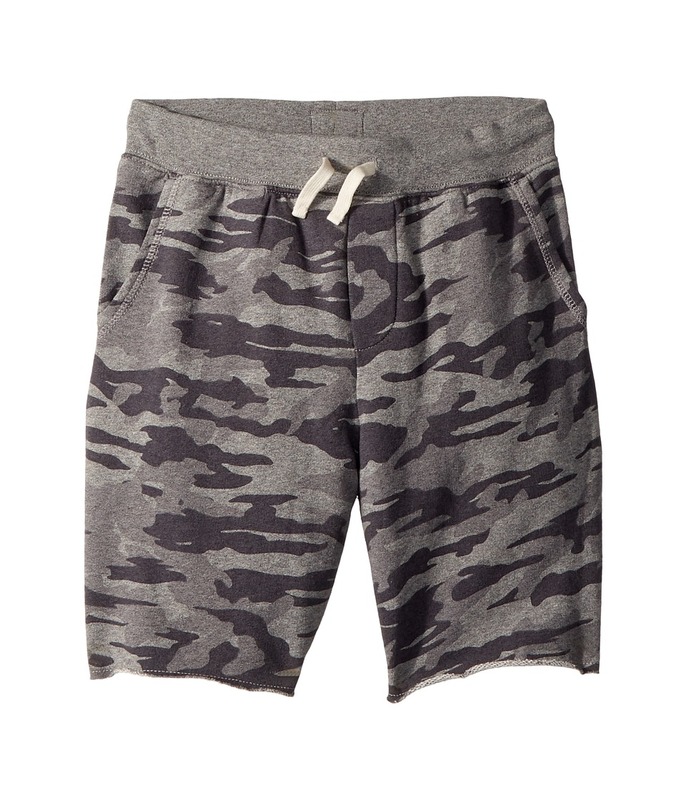 An eye-catching camouflage print adorns the super-soft French terry jogger shorts. 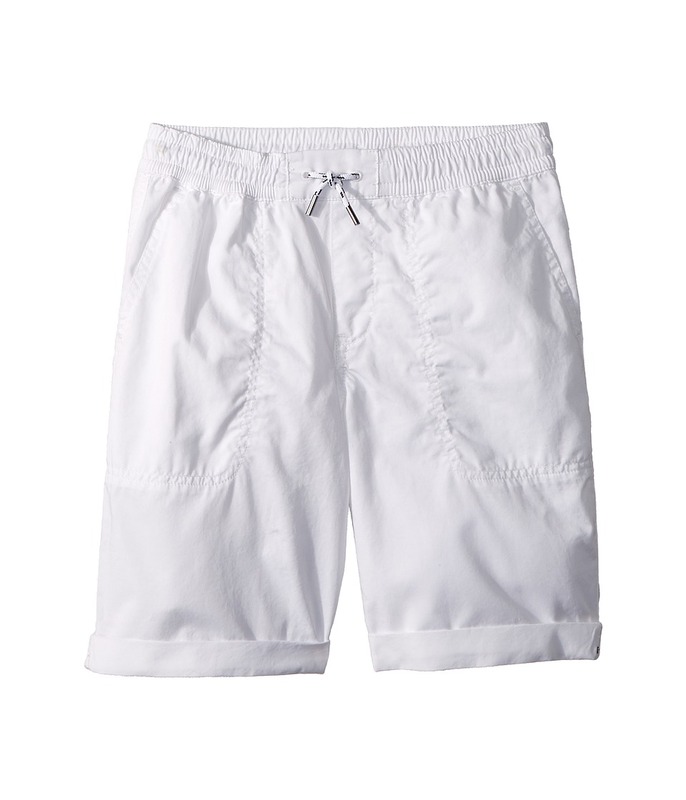 Easy pull-on design features a ribbed elastic drawstring waistband and faux-fly detailing. Woven Polo R.L. Co U-S R-L Men~s Standard Issue label at the center back waist. Four pocket design. Raw-edge trim lends a fun finish. 100 percent cotton. Machine wash cold, tumble dry low. Imported. Measurements: Waist Measurement: 26 in Outseam: 17 in Inseam: 7 in Front Rise: 10 in Back Rise: 12 in Leg Opening: 20 in Product measurements were taken using size MD (10-12 Big Kids). Please note that measurements may vary by size. Take the Polo Ralph Lauren Kids Performance Lisle Polo Shirt from the classroom to the playground with ease. Solid-colored polo shirt is crafted from a moisture-wicking stretch lisle fabric to keep him cool and comfortable all day. Ribbed polo collar with a two-button placket. Short sleeves with ribbed armbands. Signature embroidered pony at the left chest. Printed neck tag for added comfort. Tennis-tail hemline. 92 percent polyester, 8 percent elastane. Machine wash cold, tumble dry low. Imported. Measurements: Length: 23 in Product measurements were taken using size SM (8 Big Kids). Please note that measurements may vary by size. 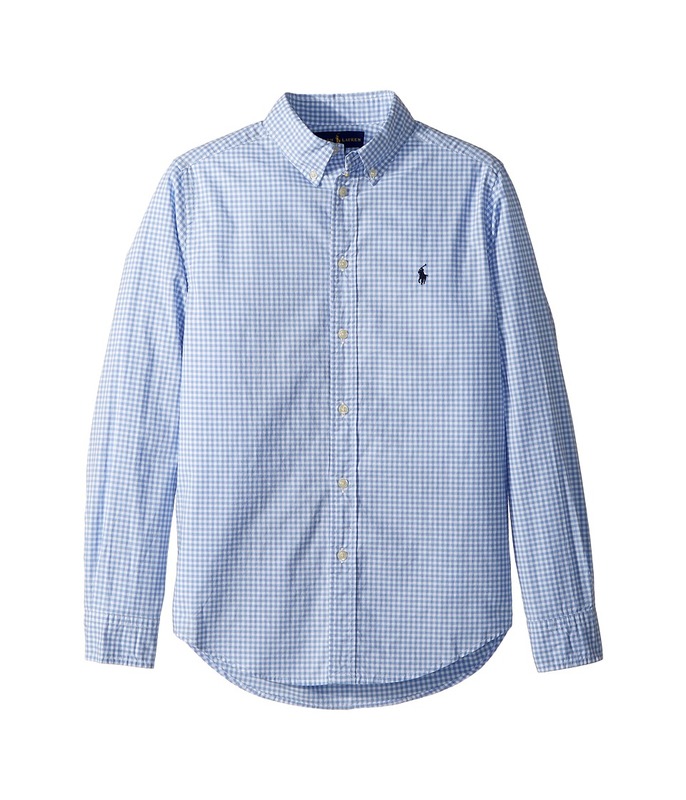 The Polo Ralph Lauren Kids Gingham Stretch Cotton Shirt is a comfortable classic that he can dress up or down. Lightweight stretch-cotton sport shirt featuring gingham-plaid pattern throughout with a signature embroidered pony at the left chest. Button-down point collar. Long sleeves with buttoned barrel cuffs. Full button-up front closure. Box-pleated back yoke. Shirttail hemline. 100 percent cotton. Machine wash cold, tumble dry low. Imported. Measurements: Length: 22 in Product measurements were taken using size SM (8 Big Kids). Please note that measurements may vary by size. Printed with POLO pride, the Polo Ralph Lauren Kids Cotton Jersey Graphic T-Shirt is sure to be the star of his summertime style. 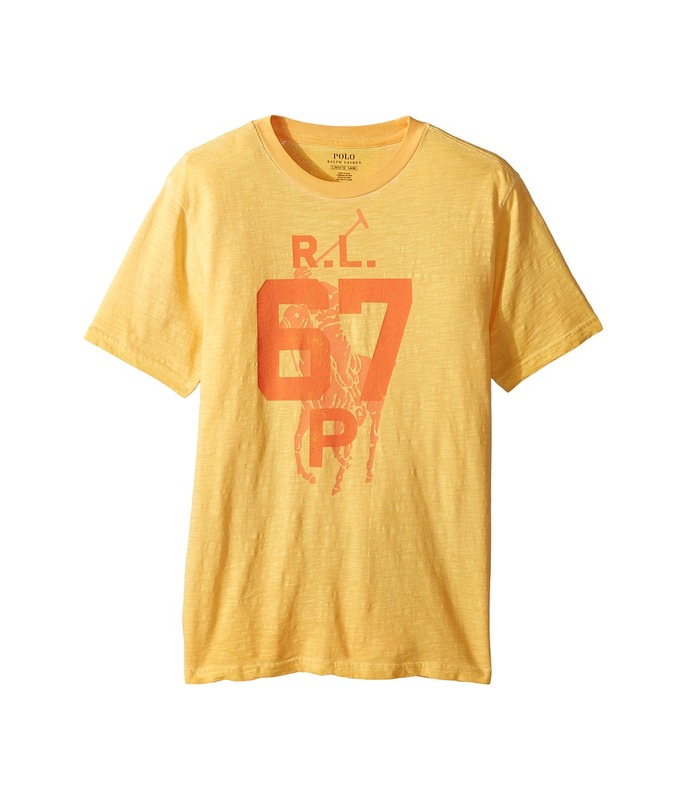 Super-soft slub-jersey T-shirt boasts an eye-catching pigment-dyed effect throughout with R.L. 67 P and a signature Big Pony printed at the front. Crew neckline with a printed neck tag for added comfort. Short sleeve construction. Easy pullover design. Straight hemline. 100 percent cotton. Machine wash cold, tumble dry low. Imported. Measurements: Length: 21 1 2 in Product measurements were taken using size LG (14-16 Big Kids). Please note that measurements may vary by size. 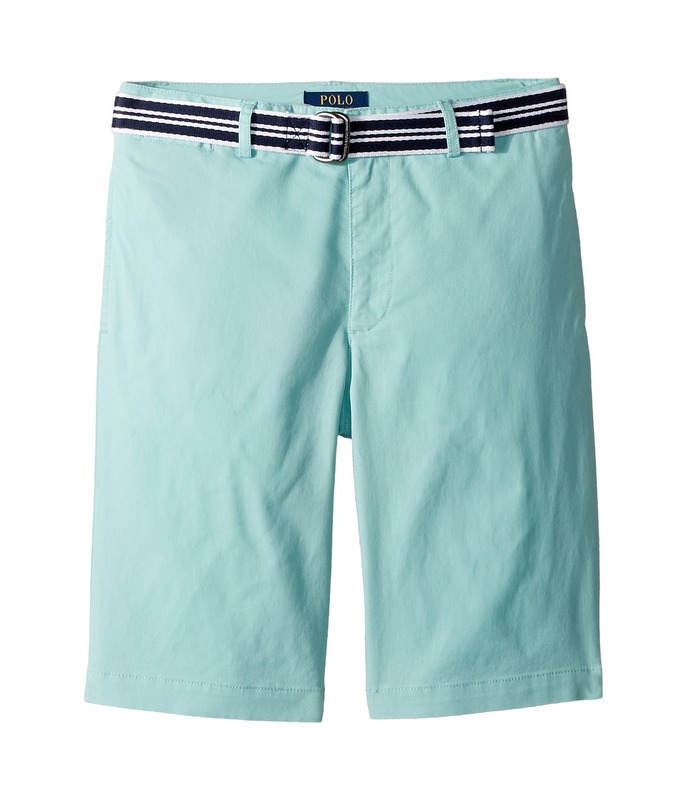 Make these must-have Polo Ralph Lauren Kids Slim Fit Belted Stretch Shorts his classic, warm-weather signature. Flat-front chino shorts feature a regular rise and straight fit to the knee. Stretch-cotton twill is washed for a soft, lived-in finish. Belt-loop waistband with a coordinating double D-ring belt. Zip fly with button closure. On-seam hand pockets. Right hip coin pocket. Button-through, back welt pockets. Canvas logo patch set above the back pocket. 98 percent cotton, 2 percent elastane. Machine wash and tumble dry. Imported. Measurements: Waist Measurement: 29 in Outseam: 18 1 2 in Inseam: 9 1 2 in Front Rise: 11 in Back Rise: 12 in Leg Opening: 16 in Product measurements were taken using size 14 Big Kids. Please note that measurements may vary by size. Take the Polo Ralph Lauren Kids Performance Lisle Polo Shirt from the classroom to the playground with ease. 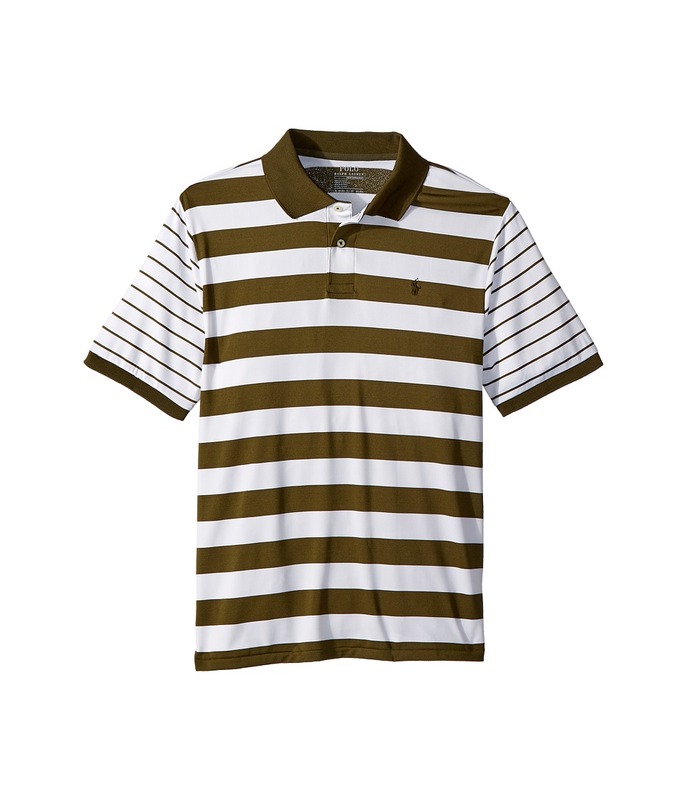 Solid-colored polo shirt is crafted from a moisture-wicking stretch lisle fabric to keep him cool and comfortable all day. Ribbed polo collar with a two-button placket. Short sleeves with ribbed armbands. Signature embroidered pony at the left chest. Printed neck tag for added comfort. Tennis-tail hemline. 92 percent polyester, 8 percent elastane. Machine wash cold, tumble dry low. Imported. Measurements: Length: 22 in Product measurements were taken using size 7 Big Kids. Please note that measurements may vary by size. Take the Polo Ralph Lauren Kids Performance Lisle Polo Shirt from the classroom to the playground with ease. Solid-colored polo shirt is crafted from a moisture-wicking stretch lisle fabric to keep him cool and comfortable all day. Ribbed polo collar with a two-button placket. Short sleeves with ribbed armbands. Signature embroidered pony at the left chest. Printed neck tag for added comfort. Tennis-tail hemline. 92 percent polyester, 8 percent elastane. Machine wash cold, tumble dry low. Imported. Measurements: Length: 16 in Product measurements were taken using size 3T Toddler. Please note that measurements may vary by size.